Social media can be defined as ‘websites and applications that enable users to create and share content or to participate in social networking [1Oxford English Dictionary. Social Media 2018 [cited 2018 Dec 27]; Available from: https://en.oxforddictionaries.com/definition/ social_ media, 2Kaplan AM, Haenlein M. Users of the world, unite! The challenges and opportunities of social media. Bus Horiz 2010; 53(1): 59-68. [http://dx.doi.org/10.1016/j.bushor.2009.09.003] ]. It consists of various types of platforms such as Facebook, Twitter, and media sharing sites like YouTube and Instagram. In recent years, social media use by health care providers has risen substantially [3Osman A, Wardle A. Is it time for medicine to update its Facebook status? BMJ 2011; 343: d6334. [http://dx.doi.org/10.1136/bmj.d6334] [PMID: 21971167] ]. In addition, social media applications have increasingly influenced the educational and learning processes [4Javed MW, Bhatti R. Usage of social media by medical and dental students at Nishtar Medical College, Multan, Pakistan. J Hosp Librariansh 2015; 15(1): 53-64. [http://dx.doi.org/10.1080/15323269.2015.982031] ] by, for instance, assisting students in seeking information regarding health care more easily and efficiently [5Chib A, Cheong YJ, Lee LCL, Ng CHC, Tan CK, Vlv K. The hope of mobile phones in Indian rural healthcare. J Health Inform Dev Ctries 2012; 6(1): 406-21.]. Recent studies have described widespread social media use among the students that involves more than one application. Facebook has been reported to be the most commonly used platform among dental students ranging between 91% - 98.9% in the United States and the United Kingdom, at 91.0% and 98.9%, respectively [6Peluchette J, Karl K. Social networking profiles: An examination of student attitudes regarding use and appropriateness of content. Cyberpsychol Behav 2008; 11(1): 95-7. [http://dx.doi.org/10.1089/cpb.2007.9927] [PMID: 18275320] -8Kenny P, Johnson IG. Social media use, attitudes, behaviours and perceptions of online professionalism amongst dental students. Br Dent J 2016; 221(10): 651-5. [http://dx.doi.org/10.1038/sj.bdj.2016.864] [PMID: 27857111] ]. YouTube and Instagram were the second most used, and Twitter showed less popularity among dental students in the United Kingdom [8Kenny P, Johnson IG. Social media use, attitudes, behaviours and perceptions of online professionalism amongst dental students. Br Dent J 2016; 221(10): 651-5. [http://dx.doi.org/10.1038/sj.bdj.2016.864] [PMID: 27857111] ]. In the United States, Google+, Twitter, and LinkedIn were the less favored [7Arnett MR, Christensen HL, Nelson BA. A school-wide assessment of social media usage by students in a US dental school. Br Dent J 2014; 217(9): 531-5. [http://dx.doi.org/10.1038/sj.bdj.2014.956] [PMID: 25377826] ]. Some students have reported accessing YouTube to view videos of dental procedures before they are scheduled to perform it [9Parkinson JW, Turner SP. Use of social media in dental schools: Pluses, perils, and pitfalls from a legal perspective. J Dent Educ 2014; 78(11): 1558-67. [PMID: 25362698] , 10McAndrew M, Johnston AE. The role of social media in dental education. J Dent Educ 2012; 76(11): 1474-81. [PMID: 23144483] ]. Students are generally using Skype and YouTube to improve educational skills, while Twitter and blogging sites are used to enhance communications and to allow for conversations between instructors and students [4Javed MW, Bhatti R. Usage of social media by medical and dental students at Nishtar Medical College, Multan, Pakistan. J Hosp Librariansh 2015; 15(1): 53-64. [http://dx.doi.org/10.1080/15323269.2015.982031] ]. Social media is also being used by doctors to distribute and spread knowledge acquired through treating patients and working with colleagues and other health care workers; in addition, postings can be made for workshop and conference announcements [4Javed MW, Bhatti R. Usage of social media by medical and dental students at Nishtar Medical College, Multan, Pakistan. J Hosp Librariansh 2015; 15(1): 53-64. [http://dx.doi.org/10.1080/15323269.2015.982031] ]. In a study conducted in South Africa, Google+ and Facebook scored the highest percentage of use among dentists, who used the platforms mainly for personal purposes [11Snyman L, Visser JH. The adoption of social media and social media marketing by dentists in South Africa. SADJ 2014; 69(6): 258-264, 260-264. [PMID: 26548200] ]. Another study also showed Facebook to be the most popular site in the United States among respondents, with 97% usage, followed by LinkedIn at 38% and Twitter with 32% [12Henry RK, Molnar A, Henry JC. A survey of US dental practices’ use of social media. J Contemp Dent Pract 2012; 13(2): 137-41. [http://dx.doi.org/10.5005/jp-journals-10024-1109] [PMID: 22665737] ]. The reasons given for using social media mostly fell into two categories, either marketing (91%) or patient communication (73%) [12Henry RK, Molnar A, Henry JC. A survey of US dental practices’ use of social media. J Contemp Dent Pract 2012; 13(2): 137-41. [http://dx.doi.org/10.5005/jp-journals-10024-1109] [PMID: 22665737] ]. In contrast, social media use as a marketing tool was reported by only 13.2% of the respondents in a South African study, but the same study indicated that this figure is expected to increase in the near future up to around 83.5% [11Snyman L, Visser JH. The adoption of social media and social media marketing by dentists in South Africa. SADJ 2014; 69(6): 258-264, 260-264. [PMID: 26548200] ]. In the United Kingdom, one study showed that more than half of dentists had accounts for their dental practice on multiple social media websites [13Parmar N, Dong L, Eisingerich AB. Connecting with your dentist on Facebook: Patients’ and dentists’ attitudes towards social media usage in dentistry. J Med Internet Res 2018; 20(6): e10109. [http://dx.doi.org/10.2196/10109] [PMID: 29959108] ]. Interestingly, more than two-thirds of dentists believed that social media networks are more effective than conventional marketing methods [13Parmar N, Dong L, Eisingerich AB. Connecting with your dentist on Facebook: Patients’ and dentists’ attitudes towards social media usage in dentistry. J Med Internet Res 2018; 20(6): e10109. [http://dx.doi.org/10.2196/10109] [PMID: 29959108] ]. It should be noted that a previous study in the UK showed that dental students lack knowledge about legal regulations and need more guidance about professional use of social media, and the study recommended implementation of training for these students on the proper uses of social media [8Kenny P, Johnson IG. Social media use, attitudes, behaviours and perceptions of online professionalism amongst dental students. Br Dent J 2016; 221(10): 651-5. [http://dx.doi.org/10.1038/sj.bdj.2016.864] [PMID: 27857111] ]. Only one study investigated social media among health profession students in the Kingdom of Saudi Arabia (KSA), and it found that YouTube was the most frequently used social media site among medical students in the KSA, reaching 42.3% for both genders [14Alsuraihi AK, Almaqati AS, Abughanim SA, Jastaniah NA. Use of social media in education among medical students in Saudi Arabia. Korean J Med Educ 2016; 28(4): 343-54. [http://dx.doi.org/10.3946/kjme.2016.40] [PMID: 27907981] ]. In addition, in the same study, Twitter was favored by males, while females chose social media apps to update their practical knowledge. Concerning learning, 95.8% of the students agreed that social media was tremendously useful [14Alsuraihi AK, Almaqati AS, Abughanim SA, Jastaniah NA. Use of social media in education among medical students in Saudi Arabia. Korean J Med Educ 2016; 28(4): 343-54. [http://dx.doi.org/10.3946/kjme.2016.40] [PMID: 27907981] ]. However, no similar study has investigated specifically the dental profession or dental students. The questionnaire was derived from modifications to previous studies [6Peluchette J, Karl K. Social networking profiles: An examination of student attitudes regarding use and appropriateness of content. Cyberpsychol Behav 2008; 11(1): 95-7. [http://dx.doi.org/10.1089/cpb.2007.9927] [PMID: 18275320] , 13Parmar N, Dong L, Eisingerich AB. Connecting with your dentist on Facebook: Patients’ and dentists’ attitudes towards social media usage in dentistry. J Med Internet Res 2018; 20(6): e10109. [http://dx.doi.org/10.2196/10109] [PMID: 29959108] , 15Barlow CJ, Morrison S, Stephens HO, Jenkins E, Bailey MJ, Pilcher D. Unprofessional behaviour on social media by medical students. Med J Aust 2015; 203(11): 439. [http://dx.doi.org/10.5694/mja15.00272] [PMID: 26654611] -18Wyatt LA, Mallonee LF, McCann AL, Campbell PR, Schneiderman ED, DeWald JP. Exploring interactions between dental hygiene faculty and current undergraduate dental hygiene students on Facebook. Canadian J Dent Hyg 2016; 50(1): 7-14.]. It was composed of four sections: The first section contained six demographic questions, including gender, age, specialty area of practice, and work region. The second section was composed of six questions measuring the general use of social media among the selected sample. The third part consisted of three major questions with multiple statements to determine the principles of professionalism in using social media. Finally, the fourth part included one question with multiple statements as answers meant to assess the role of social media in marketing. The types of answers varied and included Yes/No answers, selection of the most appropriate answer from several options, and those where all applicable answers could be selected. Personal reasons for using social media in general. Professional reasons for using social media. Attitudes toward social media in general. Participants’ opinions/attitudes toward professionalism when using social media. Professionalism guidelines when using social media. Behaviors believed to be an unprofessional use of social media. Attitudes toward using social media for business and marketing purposes. Our results regarding the use of multiple social media accounts by both dental students and dentists were similar to the previous studies [13Parmar N, Dong L, Eisingerich AB. Connecting with your dentist on Facebook: Patients’ and dentists’ attitudes towards social media usage in dentistry. J Med Internet Res 2018; 20(6): e10109. [http://dx.doi.org/10.2196/10109] [PMID: 29959108] ]. However, the results regarding the most commonly used social media platform were greatly different than previous international and local studies. For example, many previous studies ranked Facebook as the most commonly used social media platform among dental students and dentists in several countries, including the United States, the United Kingdom, and South Africa [6Peluchette J, Karl K. Social networking profiles: An examination of student attitudes regarding use and appropriateness of content. Cyberpsychol Behav 2008; 11(1): 95-7. [http://dx.doi.org/10.1089/cpb.2007.9927] [PMID: 18275320] -8Kenny P, Johnson IG. Social media use, attitudes, behaviours and perceptions of online professionalism amongst dental students. Br Dent J 2016; 221(10): 651-5. [http://dx.doi.org/10.1038/sj.bdj.2016.864] [PMID: 27857111] , 11Snyman L, Visser JH. The adoption of social media and social media marketing by dentists in South Africa. SADJ 2014; 69(6): 258-264, 260-264. [PMID: 26548200] , 12Henry RK, Molnar A, Henry JC. A survey of US dental practices’ use of social media. J Contemp Dent Pract 2012; 13(2): 137-41. [http://dx.doi.org/10.5005/jp-journals-10024-1109] [PMID: 22665737] ]. The only previous Saudi study among medical students had shown that YouTube and Twitter were the favorite platforms [14Alsuraihi AK, Almaqati AS, Abughanim SA, Jastaniah NA. Use of social media in education among medical students in Saudi Arabia. Korean J Med Educ 2016; 28(4): 343-54. [http://dx.doi.org/10.3946/kjme.2016.40] [PMID: 27907981] ]. On the other hand, our results showed that Facebook is among the least used social media platform among the target population. Instead, WhatsApp, Snapchat, and Instagram were the most commonly used. The reasons for the differences between our results and previous studies are not clear. However, it is suggested that the differences might be due to cultural variations in the United Kingdom, the United States, and South Africa studies, and with regard to the differences from the previous Saudi study, could be a result of the different nature of cases and treatments between the medical and dental professions. Given our results, WhatsApp, Snapchat, and Instagram could be the main platforms to target for the inclusion of dental educational material, and should be the focus for fabricating guidelines for the proper use of these platforms by dental students and dentists in Saudi Arabia, based on the unique nature of each application. Previous studies have marginally mentioned some of the areas where dental students and dentists use social media for educational and professional uses, including learning clinical skills [9Parkinson JW, Turner SP. Use of social media in dental schools: Pluses, perils, and pitfalls from a legal perspective. J Dent Educ 2014; 78(11): 1558-67. [PMID: 25362698] , 10McAndrew M, Johnston AE. The role of social media in dental education. J Dent Educ 2012; 76(11): 1474-81. [PMID: 23144483] ], facilitating communication between students and instructors, communicating with patients, and enhancing educational materials [4Javed MW, Bhatti R. Usage of social media by medical and dental students at Nishtar Medical College, Multan, Pakistan. J Hosp Librariansh 2015; 15(1): 53-64. [http://dx.doi.org/10.1080/15323269.2015.982031] , 12Henry RK, Molnar A, Henry JC. A survey of US dental practices’ use of social media. J Contemp Dent Pract 2012; 13(2): 137-41. [http://dx.doi.org/10.5005/jp-journals-10024-1109] [PMID: 22665737] ]. A study highlighted the use of YouTube as major platform for learning using flipped classroom in Korea [19Seo CW, Cho AR, Park JC, Cho HY, Kim S. Dental students’ learning attitudes and perceptions of YouTube as a lecture video hosting platform in a flipped classroom in Korea. J Educ Eval Health Prof 2018; 15: 24. 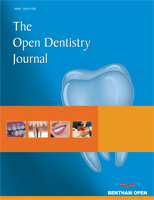 [http://dx.doi.org/10.3352/jeehp.2018.15.24] [PMID: 30317831] ], while another Saudi study explained how social media can be used to deliver oral hygiene instruction to the patient [20El Tantawi M, Bakhurji E, Al-Ansari A, AlSubaie A, Al Subaie HA, AlAli A. Indicators of adolescents’ preference to receive oral health information using social media. Acta Odontol Scand 2019; 77(3): 213-8. Epub ahead of print[http://dx.doi.org/10.1080/00016357.2018.1536803] [PMID: 30632 864] ] Our results were similar to previous studies but also added the factor of social media being used by the majority of our respondents mainly for seeking out new dental information, watching clinical procedures, and learning from others, as well as other usages that are not as common. Also, in our study, we found that these professional uses were not exclusive to students but were also found among interns and dentists currently in practice, with no significant differences between them. This shows that, when used in a proper manner, social media’s benefits extend from the college years into a dentist’s professional life. This could highlight the potential advantages of social media for dental students as well as for dentists’ continuing education. Some earlier studies noted the lack of knowledge among dental students with regard to legal regulations that could be pertinent and with regard to general professional behavior when using social media in a professional capacity [8Kenny P, Johnson IG. Social media use, attitudes, behaviours and perceptions of online professionalism amongst dental students. Br Dent J 2016; 221(10): 651-5. [http://dx.doi.org/10.1038/sj.bdj.2016.864] [PMID: 27857111] ]. Our study supports these findings, showing that around half of the students and the practicing dentists, as well do not follow university or workplace guidelines when using social media. Further, around one-third of our respondents reported not having any professionalism guidelines, which raises a red flag concerning social media use by these health care workers and whether it is done in a non-harmful manner. In fact, this was made clear in our study where only about one-third of both dental students and dentists (with no significant differences) believed that it is a problem to post patient information and photos without the patient’s permission. Furthermore, around half of our respondents considered egotistic displays, criticism of colleagues, and critical comments about dental organizations to be acceptable behavior. This clearly demonstrates the gap in professional guidelines for both students and practicing dentists in regard to communicating with patients and regarding their careers when using social media. This was also was noticed in another study where dental students in the UK were not aware of the definition of professional [21Knott PN, Wassif HS. Older and wiser? First year BDS graduate entry students and their views on using social media and professional practice. Br Dent J 2018; 225(5): 437-40. [http://dx.doi.org/10.1038/sj.bdj.2018.745] [PMID: 30168814] ]. More importantly, this shows that there is a major breach to patient’ confidentiality, which is a major flaw in using social media and should be handled seriously. It is suggested that this situation is a result of the recent emergence of social media and that there was not enough educational material to be included in dental ethics curricula for students or in practicing dentists’ continuing education programs. Despite the announcement of some legal consequences of certain unethical social media actions in Saudi Arabia by the Saudi government, it seems that there is little awareness of these governmental guidelines for the use of social media. Also, according to the best of our knowledge, there were no official guidelines to use social media have been given to the students in the investigated dental school, which might be different than other dental schools in other countries. Thus, it is important to include such modules in dental student and dentist educational materials and to call for more organizational policies on a national level around the professional use of social media in order to preserve patients’ and dentists’ rights. From another perspective, the results of previous studies in relation to social media use for marketing purposes were controversial in terms of differences between dental students and dentists and between participants from different countries, including the United States, the United Kingdom, and South Africa, as detailed in the introduction [11Snyman L, Visser JH. The adoption of social media and social media marketing by dentists in South Africa. SADJ 2014; 69(6): 258-264, 260-264. [PMID: 26548200] -13Parmar N, Dong L, Eisingerich AB. Connecting with your dentist on Facebook: Patients’ and dentists’ attitudes towards social media usage in dentistry. J Med Internet Res 2018; 20(6): e10109. [http://dx.doi.org/10.2196/10109] [PMID: 29959108] ]. Our study indicated that around half the dental students use social media for marketing, in comparison to around one-third of interns and dentists who do the same. This result is considerably lower than that found in the United States [12Henry RK, Molnar A, Henry JC. A survey of US dental practices’ use of social media. J Contemp Dent Pract 2012; 13(2): 137-41. [http://dx.doi.org/10.5005/jp-journals-10024-1109] [PMID: 22665737] ], but it is higher than what has been found in South Africa [11Snyman L, Visser JH. The adoption of social media and social media marketing by dentists in South Africa. SADJ 2014; 69(6): 258-264, 260-264. [PMID: 26548200] ]. Nevertheless, more than half of the dental students and dentists in our study believe that social marketing might be more effective than conventional marketing. Also, many participants (though more among dental students) believe that posting before and after treatment cases on their social media accounts has high marketing value for them. This is important, as it should be linked to the lack of professional knowledge and beliefs about using social media found among both dental students and practicing dentists in Saudi Arabia.